A statue believed to be of King Tutankhamun’s grandmother has been discovered accidentally by archaeologists working in an ancient mortuary temple in Egypt. European archaeologists studying areas of the King Amenhotep III Funerary Temple along the west bank of the River Nile came across the alabaster carving. 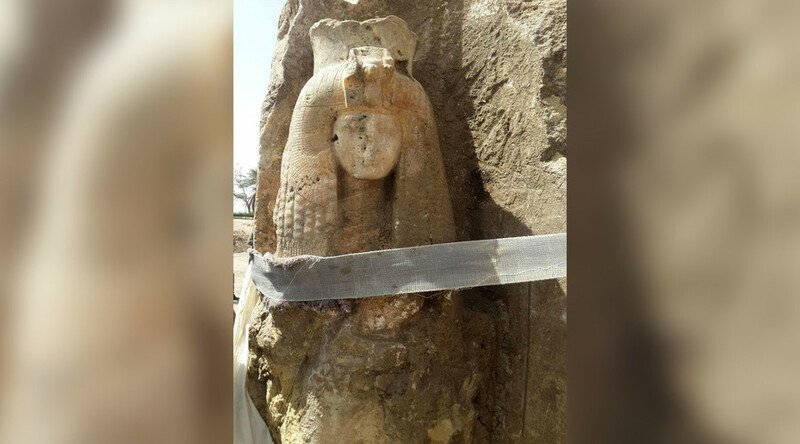 According to the Egyptian Ministry of Antiquities, it was uncovered after a section of a sculpture to King Amenhotep III was lifted up and moved. It is believed that the previously unnoticed statue is in honor of Queen Tiye, wife of King Amenhotep III and grandmother to boy-pharaoh Tutankhamun. Restoration work will now begin on the piece, which displays intricate carvings potentially dating back centuries. The King Amenhotep III Funerary Temple was built between 1390 and 1353 BC to hold the remains of royal Egyptians after their deaths, according to the World Monuments Fund. A statue to Queen Tiye had, until now, never been found inside the temple. The discovery comes more than 100 years after her mummified body was found in the Valley of the Kings by French archaeologist Victor Loret. Earlier this month, the Egyptian Ministry of Antiquities showed off another historical find in the form of a large statue pulled from a wasteland in a Cairo suburb. Initially said to be of Pharaoh Ramses II, the Egyptian cultural agency now believes the massive effigy depicts Psamtik I – the first king of Egypt’s 26th Dynasty.